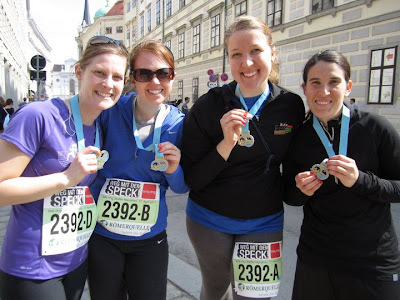 As part of our training for the Hallstatt Half Marathon May 1st we ran the Vienna Marathon as a relay team. Here's Whitney finishing the first leg. Notice I'm still nice and fresh....not for long. 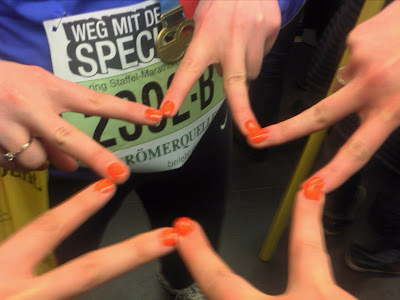 We finished and have medals to prove it: Yvonne, Nicki, Whitney and me. Then to the baths and home. The great thing about reading such a big book is that it never seems to end. While that might sound daunting to some, it's nice to have it to fall back on. Because when you're done you kind of wander around the house wondering what to do next...not quite ready to undertake another book but without the comfort of an automatic activity that reading it had become. Yeah...Whitney thought it would give us inspiration for the relay. Strangely, it makes me feel kind of feminine to see color flashing around when I move my hands.